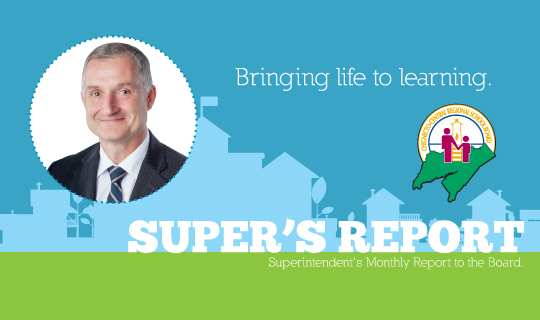 Last evening Superintendent Gary Adams presented the May issue of his monthly report to the governing board. Superintendent Adams highlighted the work of CEC English teacher, Glenn Thompson, and the way he connects curriculum to relational theory and the Restorative Approach, as well as the 10th anniversary of Roots of Empathy in CCRSB schools, a focus on the Social Justice Pillar of Abilities in "What's in your backpack?" and a peek at the work of CCRSB's graphics and web designer, Jackie Brown. The report also contains stories and information from our 70 schools, as well as congratulations to staff recently recognized for their outstanding works! Click here to read the May issue! Watch Glenn Thompson in action, and hear from his students!